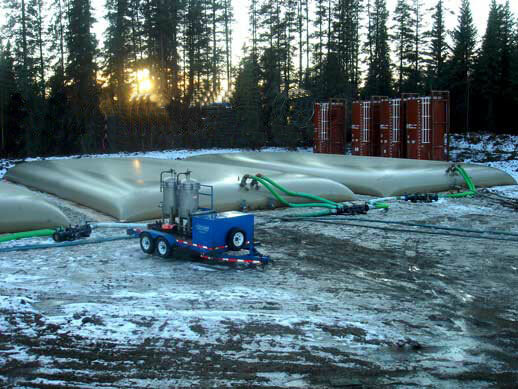 The Flexible Frac Tank is an economical solution for any location looking to store large amounts of water in an oil filed, mining or hydraulic fracturing location. Made from a robust urethane fabric, these tanks well-equipped to handle both the weight and volume of the liquid being stored. Additionally, all tanks are able to be rolled or folded for movement from one location to the next. 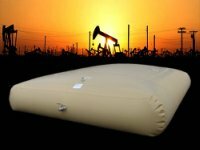 Similar in both design and style to our standard Flexible Pillow Tanks, these frac tanks features a flexible fabric that will rise into shape as it is filled with water. Rather than featuring a rigid exterior, these tanks will be low in profile to accommodate large storage capacities. *Tanks can be sized in any model up to 210,000 gallons for bulk storage in your location. Fabric: The standard frac tanks water storage shown here is built with a 32 or 34 ounce urethane. This liner holds a high resistance to puncture and weather elements, as well as an appropriate liner to match your tank storage materials. While many of our hydraulic frac tanks are designed for the storage of a water-based material, they can also be constructed to store fuel and certain hydrocarbons. Fittings: Standard fittings for these tanks include fill/discharge ports, drain ports, hoses, and vents. However, tanks are often built with job-specific fittings to match your location, application, or area requirements. Please don't hesitate to send us your specifications.